Photo I took of the doves in my garden. The doves gave me a great show today – they were doing the “wild thang”, and were very unfussed by Dexter and my presence and the camera. I love the birds in the garden – they wake me up every morning from about 5 am as they dart from tree to tree picking off the berries. I also have starlings who visit our pond every day for a drink of water and a wash in the bird baths. Sometimes we have as many as six of them playing in the baths when its very hot. Unfortunately they are too fast for me to take photographs, but I will keep trying. Love the photo and the birds in the garden. I also take great pleasure in watching the neighbourhood birds come and eat with my chickens. They also pop in at about 4pm and take a bath in the drinking bowl. Most times there are about 20 of them going nuts, splashing and flapping! Simple pleasures!! 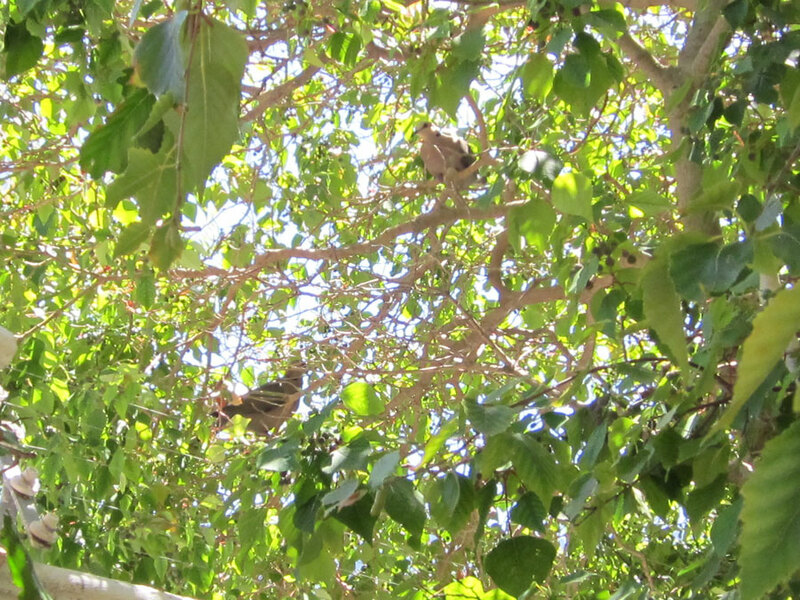 Today I had some lovely birds playing in the Frangipani tree. I have no idea what type of birds they are – pretty with yellow breasts. I think I need to buy a “bird book” to help me identify them.